Oprah Winfrey showed up in Georgia to stump for Gubernatorial candidate Stacey Abrams, a rabid leftist with a trail of scandals. But, don’t tell Oprah that. She blasted the crowd in Marietta with slavery metaphors, invoking “lynchings” and “oppression” as the reason to vote for Democrats. 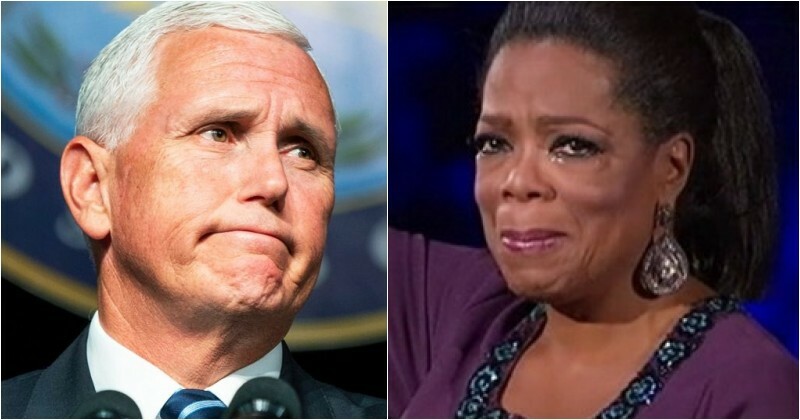 Well, little did Oprah know, Vice President Mike Pence would make her regret it. Oprah Winfrey couldn’t help herself. Like most leftists, Winfrey is led by her emotions, not by facts. So, when she saw this African-American woman named Stacey Abrams embroiled in the governor’s race in Georgia, Oprah had to get involved. Oprah brought her star-power and money to a campaign for a woman who hates “the free market” in favor of socialism. Abrams is in debt, too, big time. “Abrams owes more than $50,000 to the Internal Revenue Service and about $170,000 more in credit card and student loan debt, according to personal financial disclosure documents the candidate for governor released this week,” reports the Political Insider. Well, how about how Abrams handled a voter fraud scandal? According to the Atlanta Journal-Constitution, Abrams headed the New Georgia Project, which was just like ACORN. Abrams was found to have mishandled thousands of voter registration cards in Georgia. She took in the money for the registration drive and delivered next to nothing. Then, she blamed Georgia Secretary of State Brian Kemp, who is now running against her for governor. “The [New Georgia] project’s months-long statewide registration effort launched by then-state Democratic House Minority Leader Stacey Abrams devolved into accusations of voter fraud, counteraccusations of voter suppression and a lawsuit won by Georgia Secretary of State Brian Kemp over allegations that he and local elections officials misplaced thousands of registration forms submitted by the project,” reported the Atlanta Journal-Constitution. But, hey, Oprah Winfrey says Stacey Abrams is her candidate. Of course, Abrams stinks to high heaven. That’s why Oprah had to harken back to the slave days. She wants voters to know they are racists if they don’t vote for Abrams. Well, not only did Oprah not do her homework on Stacey Abrams, but she must not have realized there was someone else in Georgia; namely, Vice-President Mike Pence. “I heard Oprah is in town today,” Pence said at a rally. “I heard Will Ferrell was going door-to-door the other day. I’d like to remind Stacey and Oprah and Will Ferrell, I’m kind of a big deal, too,” he continued. Georgia certainly is not Hollywood. And, Stacey Abrams is not qualified to be their governor, either. The good people of Georgia have been blasted by the Hollywood crowd, and Hollywood cash is pouring into Abrams campaign coffers. But, we trust, in the end, Georgians know they can’t trust the celebrity pack of wolves to tell them who should govern their state. Oprah’s track record stinks. She brought us Barack Obama and Hillary Clinton. We don’t need that kind of help ever again.